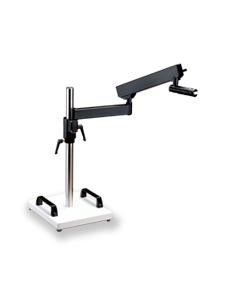 SPOT Imaging modular boom stands provide stability and easy positioning for stereo microscopes and cameras. The boom stands are machined and finished using high quality, durable materials to ensure that they can safely support your equipment for years to come. Available base options include a weighted steel base, table clamp, and table mount with backing plate. Stainless steel vertical posts are available standard in 15.75″ and 24″ lengths but can be custom cut. The boom stands are compatible with new and legacy stereo microscope brands including Zeiss, Olympus, Leica, Nikon, and Meiji. The boom stands also support all 76 mm stereo microscope pods and all cameras that have the standard 1/4″-20 threaded hole. The horizontal arms of the SMS15/16, SMS6B and SMS25 boom stands terminate in an industry standard bonder socket mount. Tilting and non-tilting adapters to mount cameras and stereo microscopes that don’t have the industry standard bonder dowel are available separately if needed. The SMS20 boom stand catalog numbers include a heavy duty tilting and swiveling mount. The SMS15/16 is a light duty, low cost boom stand available with a weighted base, table clamp or table mount. The SMS15/16 is suited for routine inspection of large samples where continuous horizontal movement of the stereo is not required. Maximum arm load rating is 40 lbs. Arm terminates in a bonder mount socket. Stereo microscopes without bonder dowels and cameras can be mounted with the use of a SPOT Imaging tilting or non-tilting mount. The SMS6B is a sturdy boom stand providing smooth horizontal arm adjustments. They are available with a weighted base, table clamp or table mount. The SMS6B is the best choice for inspection work that requires continuous movement of the arm. Maximum arm load rating is 40 lbs. Arm terminates in a bonder mount socket. Stereo microscopes without bonder dowels and cameras can be mounted with the use of a SPOT Imaging tilting or non-tilting mount. The SMS25 is a light duty boom stand providing smooth horizontal and vertical movement. 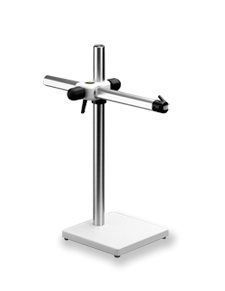 It is available with a weighted base, table clamp or table mount. The SMS25 is the best choice for smaller microscopes without cameras where lab space is limited and repetitive motion is necessary. Maximum arm load rating is 21 lbs. Arm terminates in a bonder mount socket. Stereo microscopes without bonder dowels and microscopes can be mounted with the use of a SPOT Imaging tilting or non-tilting mount. The SMS20 is a sturdy boom stand providing smooth horizontal arm adjustments. 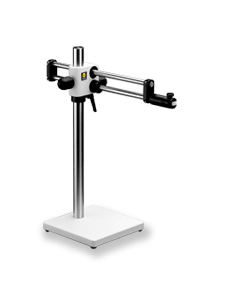 It is available with a heavy weighted base, table clamp or table mount. The SMS20 is the best choice for large research stereo microscopes with cameras. Maximum arm load rating is 100 lbs. 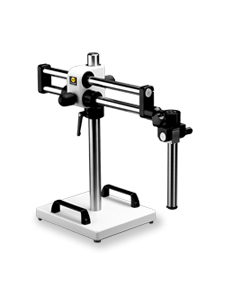 The SMS20 includes a heavy duty tilting and swiveling mount for stereo microscopes or cameras.